Data centers tend to consume more energy than most other comparably sized facilities in any industry. Because of their critical nature, businesses and design professionals have had the propensity to vastly overdesign the facilities in order to prevent costly devastating outages of the computing equipment. Since about 1999, various groups started evaluating methods to provide users with highly reliable data centers, but at a fraction of the power previously used to keep computing equipment cool. Some of the recommendations seem trivial but can have profound impacts on the design of datacoms. For instance, persuading equipment manufacturers to provide "heat release and airflow values" with their equipment (rather than simple nameplate information) allows engineers to assess actual heat loads much more accurately - this often leads to a downsizing of heat load by a factor of two or more. Likewise, the suggestion of ideal equipment placement and orientation avoids the very common mistake of poorly placed equipment pushing hot air from the exhaust of one rack into the intake of another. 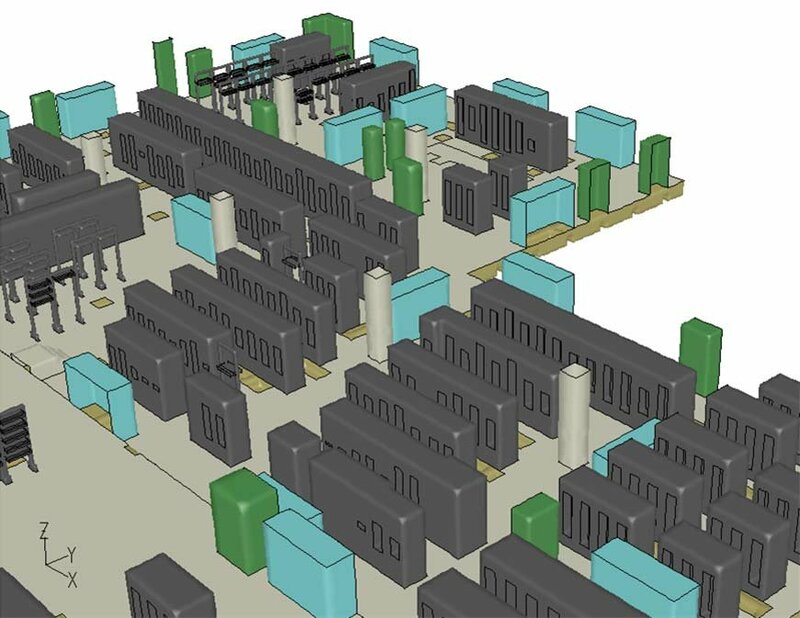 CFD modeling has become a very important part of green data center design because the performance of the center can be evaluated and subsequently "tuned" to get the best energy efficiency without compromising reliability. Many "what-if" scenarios may be run to evaluate standard solutions to innovative ones laid out by TC 9.9, or even solutions involving liquid cooling may be evaluated using CFD. M/E Engineering has evaluated numerous data centers - from very small to very large - and has guided the design teams on each project toward energy efficiency and the implementation of common sense design features. 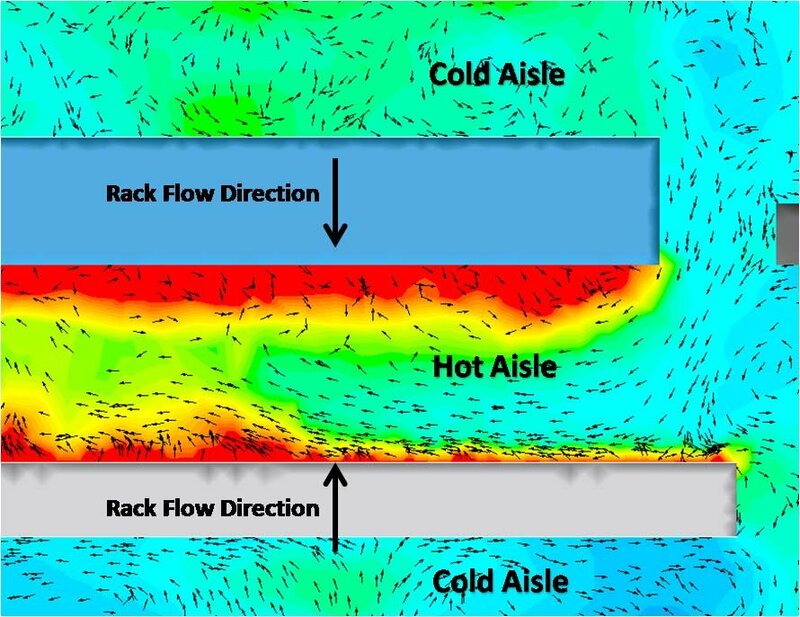 CFD analysis of air patterns and their ability to aid in the cooling of electronic equipment. Green design based upon ASHRAE TC9.9 - CFD guided mechanical, electrical and plumbing design. Studies of alternative designs for racks and computing equipment to ensure adequate cooling at minimal energy consumption. Assessment of Computer Room Air Conditioning (CRAC) system failure. 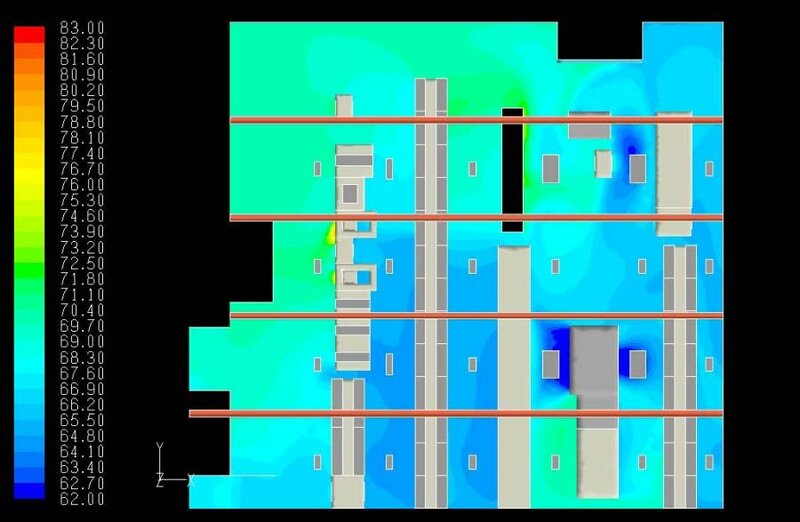 Fire and smoke analysis of fire extinguishing and smoke mitigation systems in data centers. 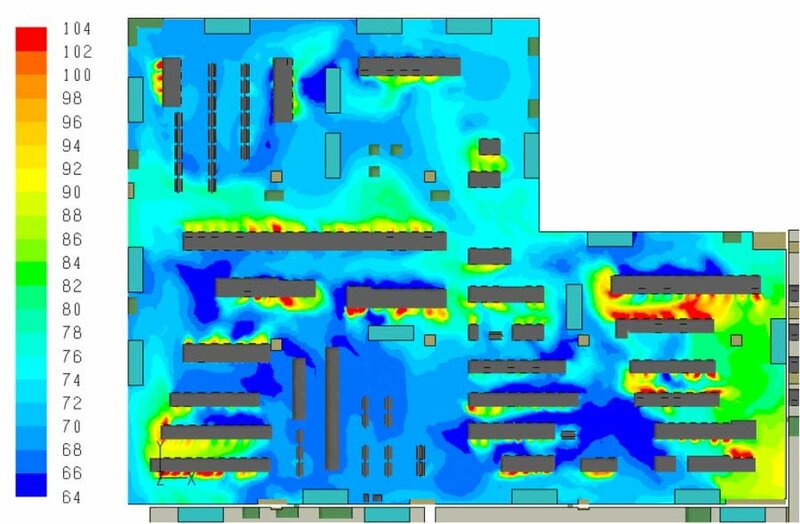 Temperature contours in a large data center. Results show row-to-row 'exhaust to intake.' Improper cold aisle/hot aisle arrangement.